The Center for Science in the Public Interest (CSPI), a.k.a., the food police, was very loud this week with strong criticism of Congress’ involvement with influencing the 2015 Dietary Guidelines for Americans (DGAs). You can read more HERE. CSPI’s published opinion came one day after U.S. Agriculture Secretary Tom Vilsack and U.S. Secretary of Health and Human Services Sylvia Burwell co-authored a blog post on October 6 stating that while issues of the environment and sustainability are critically important, sustainability is not within the scope of the 2015 DGAs. For background, in February 2015, the U.S. Dietary Guidelines Advisory Committee (DGAC) submitted their recommendations for the development of the official DGAs. For the first time, the panel suggested that food system sustainability be incorporated into the federal government’s dietary advice. The sustainability card played into recommendations that Americans eat more plant-based foods, as such foods might alleviate strain on the environment. It sounds as if sustainability will not be part of the DGAs. However, on its own, mostly plant-based diet recommendations are expected to be included. Milk and dairy products are and will remain an important part of the DGAs. But dairy processors may want to get creative with formulations and product positioning in order to better compliment dietary advice. The same day Vilsack and Burwell wrote their blog, Peter Whoriskey, a staff writer for The Washington Post, wrote, “For decades, the government steered millions away from whole milk. Was that wrong?” You can access the article HERE. This pro-whole milk theme continued the next day when Editor Joel Achenbach wrote “Whole milk is okay. Butter and eggs too. What’s next—bacon?” You access the article HERE. Achenbach reached out to food activist Michael Pollan, author of The Omnivore’s Dilemma, who for long has argued that you should eat the kind of food that your grandmother would recognize, which includes eggs and whole milk. You must read what Pollan says about skim milk being silly and why he only drinks whole milk, and has for years. Link HERE. Last week’s blog on Milk Innovations, which can be accessed HERE, generated a great deal of discussion, particularly among my dietitian readership. They applauded my statement that fluid milk is the most underdeveloped dairy category in the U.S., with opportunities for category growth coming from flavored milk—with some fat, not necessarily whole, but reduced-fat with minimal added sugar--and nutritionally enhanced milk, not the boring white stuff. “Fluid milk certainly has an irreplaceable package of nutrients with unique interactions and our nutrition portfolio only continues to grow with the industry’s investment in nutrition research and nutrition education,” wrote Tammy Anderson-Wise, CEO, Dairy Council of California, in an industry newsletter. I interviewed Anderson-Wise for an article I wrote for Food Business News on "The Future of Flavored Milk," which was published this week and can be accessed HERE. She said that flavored milk presents an opportunity to increase fluid milk consumption and get American consumers back to the number of daily dairy servings recommended by the 2010 DGAs. These guidelines recommend adults consume three servings of low-fat and fat-free dairy products daily. Children between four and eight years of age should consume two-and-one-half servings, while children ages two and three should consume two servings. The recommendations are expected to remain “similar” in the 2015 DGAs. According to Cary Frye, vice president of regulatory and scientific affairs at the International Dairy Foods Association, the DGAC report identified three model dietary patterns associated with positive health outcomes and optimal intake of nutrients: vegetarian, Mediterranean and traditional U.S.-style diets. “Both the healthy U.S.-style and vegetarian diets include three servings of low-fat and fat-free dairy products daily, but the Mediterranean diet only includes two servings a day,” she says. “Mostly plants” does not mean only plants. The Egg Nutrition Center (ENC) developed a very effective communication tool addressing the “mostly plant-based diet recommendations” and the critical role of including high-quality, complete protein in such a diet. A plant-based diet doesn’t mean only plants, according to ENC. 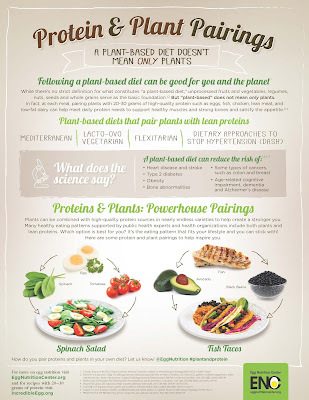 In fact, at each meal, pairing plants with high-quality protein such as eggs, fish, chicken, lean meat and low-fat dairy can help meet daily protein needs. Click on this infographic to learn more. Here’s where fruit, nut, seed, vegetable and whole grain ingredients come into play, as they can attract consumers who want to increase their plant food intake, but at the same time, want to make sure they consume quality protein. This is a huge opportunity for dairy processors, in particular yogurt and other cultured dairy manufacturers, to get consumers to keep dairy foods on the menu. Don’t believe me? Read an article entitled “Seeds and Grains in the Dairy Aisle” just published in this month’s Today’s Dietitian by linking HERE. Here are some innovative examples recently introduced to the marketplace. 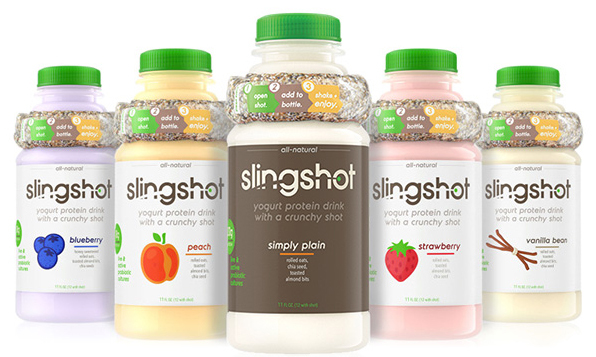 Slingshot Foods patented this unique package for a drinkable high-protein yogurt. 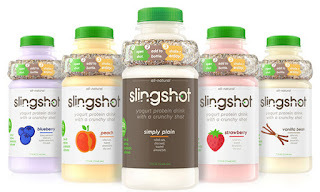 Developed by a former refrigerated smoothie yogurt executive who wanted a macronutrient-dense, simple ingredient portable breakfast, Slingshot is a yogurt protein drink with a crunchy shot wrapped around the bottle neck and intended for the consumer to pour into the yogurt, shake and drink. That shot is a patented plastic stick pouch filled with chia seeds, rolled oats and toasted almond bits. It contributes 3 grams of fiber and 600 milligrams of the omega-3 alpha linolenic acid to the beverage. The beverage is made with low-fat yogurt enhanced with milk protein concentrate and sweetened with agave. A serving contains 295 to 355 calories, 10 to 11 grams of fat and 18 to 20 grams of protein, depending on variety. There are five varieties: Blueberry, Peach, Simply Plain, Strawberry and Vanilla Bean. For more information, link HERE. General Mills now offers Yoplait Plenti, a new way to enjoy nonfat Greek yogurt. Yoplait Plenti blends Greek yogurt with fruits (except the vanilla variant), whole grain oats, flax and pumpkin seeds. At 5.5 ounces, the single-serve containers are a little larger than standard Greek yogurt cups, which are 5.3 ounces. Each serving provides 140 to 150 calories and 1.5 to 2 grams of fat, depending on variety, as well as 1 gram of fiber, 12 grams of sugar and 12 grams of protein. The eight varieties are: Black Cherry, Blueberry, Coconut, Peach, Raspberry, Spiced Apple, Strawberry and Vanilla. The protein comes from the cultured nonfat milk and the grains and seeds. The fat and fiber come from the grains and seeds. For more information, link HERE. Stonyfield is offering Super Grains and Super Seeds exclusive to Target stores. The new organic yogurt lines each have three variants. Super Grains comes in Maple, Strawberry and Vanilla flavors. Each combines nonfat Greek yogurt with buckwheat and quinoa. Super Seeds comes in Blueberry, Coconut and Orange-Cranberry. Each combines nonfat Greek yogurt with softened flax seed. All six offerings come in 5.3-ounce bowls, where the bottom is clear, so that consumers can see what’s inside. A single-bowl serving contains 140 to 150 calories and 17 to 20 grams of sugar, depending on variety. Each also contains almost no fat, just under a gram of fiber and 13 grams of protein—from both dairy and plant sources. 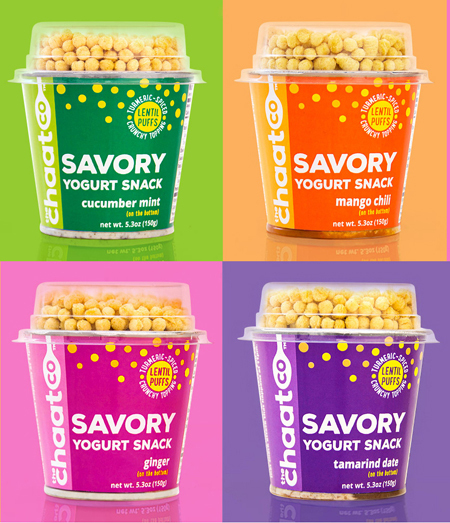 The Chaat Company recently made its debut at Expo East with Savory Yogurt Snack in four varieties: Cucumber Mint, Ginger, Mango Chili and Tamarind Date. 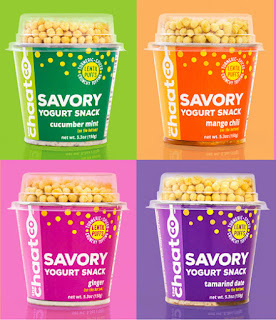 The new company’s innovative product concept is based on the “street food” of India, which is the translation of chaat. The 5.3-ounce cups are basically inverted layered salads that consumers mix up for a hearty combination. The bottom layer combines fruits, vegetables, herbs, spices and sea salts. This is visible through the clear-bottom serving container. This gets topped with whole milk probiotic yogurt made from New York grass-fed cows. The cup has a separate dome container of crunchy, spiced lentil puffs. 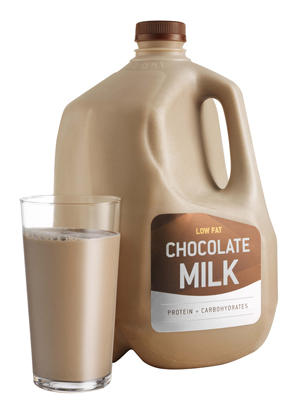 Each single-serve container delivers 6 grams of protein from milk and lentils. A serving contains 100 to 140 calories, 4 to 4.5 grams of fat and 6 to 13 grams of sugar (no added sugar), depending on variety. For more information, link HERE. In Finland, Valio offers seeds in a dome cup atop single-serve containers of cottage cheese. The new Premier Cottage Cheese line comes with a spoon inside the lid for easy on-the-go eating. There are two varieties: Fruit and Root Vegetables. The Fruit offering contains dried, candied pineapple, dried, candied papaya, sunflower seeds, pine seeds, pumpkin seeds and dried, sweetened cranberries. 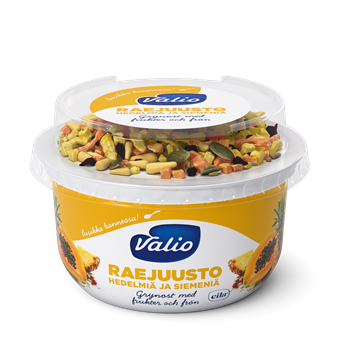 The Root Vegetables variant contains sunflower seeds, pumpkin seeds, beetroot, parsnips, grilled peppers and grilled onions. For more information, link HERE. Nuts, seeds and grains, along with fruits and vegetables, are great additions to lower-fat dairy foods. They provide extra nutrition, texture and visual enhancement. To learn more about how to improve the mouthfeel of such products, link HERE and register for a webinar that focuses on formulating delicious, on-trend lower-fat dairy foods.